Sophia came to us as most chicks do, from our local feed store as a 2-3 day old baby chick. She was one of two black sexlinks we purchased that day. It was our first time taking in any sort of poultry and man was it a learning curve. Within weeks all 12 girls were moved outside and in only a matter of months we had these gorgeous rich eggs. It was such an exciting time! Miss Sophia has been with our family for just a short three years, she was the prettiest of them all with these stunning black and brown feathers that literally shimmered in the sunlight. Her personality was what every chicken owner wants; fun, sassy but above all friendly. My 9 year old boy loved going out to greet her and hold her everyday and she enjoyed it too. She would let him pick her up and would sometimes be found not too far behind him in the yard. Her favorite treats were watermelon, blueberries and black soldier fly larva. She was the fastest to gobble these down. After saying goodnight to all of our ladies and gentlemen last night we noticed Sophia was missing. We diligently put on headlamps and headed out to search our yard; it was our son who found her laying in her dust bathing area, she was alive but seemed to be sleeping. I immediately thought it was bizarre that she hadn’t roosted as her spot was always right next to our beloved rooster James. I quickly examined her with no fight from her, there was nothing wrong. We placed her in our “retired/ get well” separated area and went to bed. This morning my husband dutifully went outside to feed and check on our flock and came back inside to let us know Sophia had passed in the night. After an examination we are just baffled. Her skin was as it should be, she had an abundant amount of new beautiful feather growth, there were no signs of an attack or broken bones, her feet looked well and her bum was clean. Nothing obvious, no foul play, no sign of illness, no odd behavior (I know this because just yesterday I was out cleaning their coop and nesting boxes). As we sit trying to rack our brains of all the things it could be, it’s hard to believe our sweet girl is really gone and although this is not our first loss this one is a bit harder to accept; possibly for a lack of reason. Our Miss Sophia will be so so missed, your loud squawks, your tender hugs, your tenacity for being the first at your favorite treats and your sweet way of making us laugh and smile will be missed. We all love you and hope that chicken heaven is full of your favorites; we will all see you again one day. Thank you so much for this very fitting tribute to a beautiful hen, Patricia. I also love this type of chicken - they are always funny and inquisitive. When a hen dies unexpectedly, it's very hard to come to terms with. There is often no explanation. 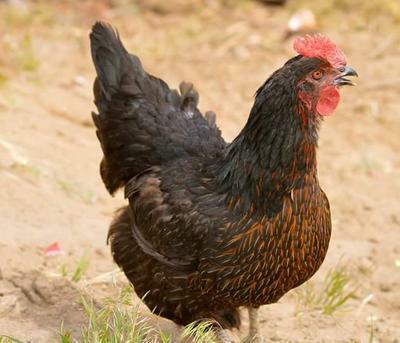 Sudden Chicken Death Syndrome is a recognised condition but even so, it's never clear what the underlying problem is. Sophia had a happy life with you, with lots of treats and a family who cared about her. She was loved.